The RB-DA4x5 4 Input, 4 x 5 Output Distribution Amplifier/Mixer. The RB-DA4x5 is a 1U rack-mount combined distribution amplifier and mixer. It has 4 mono analogue audio inputs on female XLR and 4 groups of 5 outputs on 15 way D-type connectors. Each output group has a five way front-panel DIP switch assigned to it which is used to select the input(s) to send to the output group. This enables each of the four inputs, or a 1kHz 0dBu tone, to be mixed to the output group. 4 input, 20 output distribution amplifier. Audio prescence LED’s for inputs or outputs. Balanced I/O that can be wired unbalanced. Outputs a 1kHz test tone e.g to check transmission lines. The inputs and outputs are electronically balanced and can be wired unbalanced. Each input has adjustable gain using a pre-set potentiometer, providing a gain range of -8dB to +18dB. 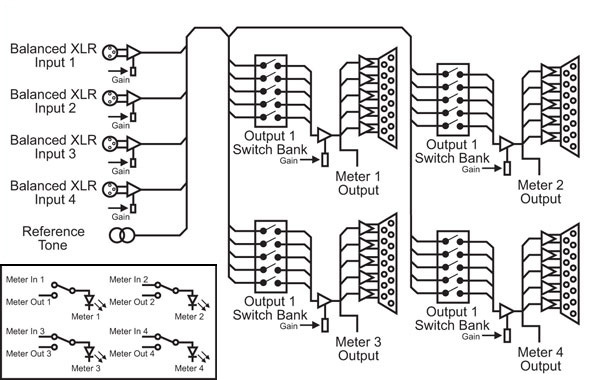 Each output is individually buffered so that a short circuit on one output won’t affect the others. The output gain of each group can similarly be adjusted between -8dB and +18dB using pre-set potentiometers. The DIP switch settings and gain controls are recessed beneath a front-mounting screw-on cover so that settings can not be accidently altered, for secure applications. Four bright front-panel signal present LEDs show the levels of either the inputs or the output groups by pressing the AUDIO PRESENCE button. The LEDs will show green illumination from -12db through to 0db, amber from 0db through to +6db and red for inputs and outputs at +6db and over.